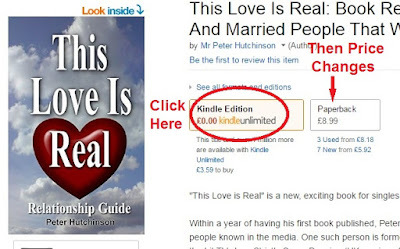 If you are an author or self publisher I suggest you check your links and prices on Amazon. They may be charging ridiculous prices that you never set and misleading potential buyers. I will show you what happened (is happening) with my books. This has happened with the Amazon UK and USA sites and it may be happening with other Amazon stores worldwide where my books are available. This picture is a list of my books. The ones with the red rings around them are NOT the correct price with some 3 times the actual price. As an example I will use my book This Love Is Real. 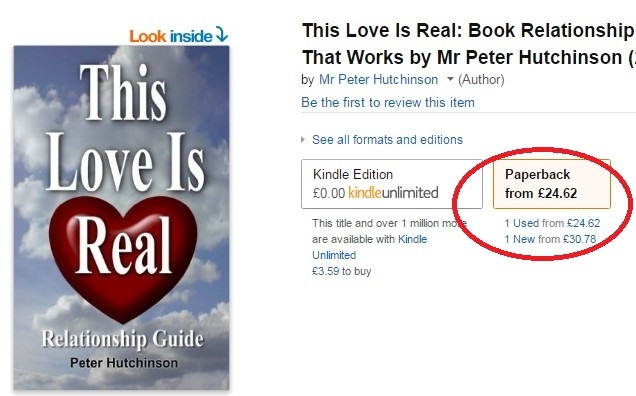 You can see that the paperback is priced at £24.62 as a USED copy, with the NEW copy starting at £30.78. This is outrageous as the book is only £8.99 brand new on Amazon UK. The way I found out to get to the right price was to first click on the “Kindle Edition” tab then the correct price of £8.99 appears on the "Paperback" tab. Why Amazon is doing this is unfair for all authors who this is happening to. If you think authors get more money out of this you are sadly mistaken. We get far less no matter how high the price is. Someone else is capitalizing on incorrectly priced books and the authors are getting around £1.00 for each book sold that the price is incorrectly highly priced. To help you so you are not misled, here are the correct retail prices for my books on Amazon. For all other Amazon stores around the world, follow the process that is above. First click on the “Kindle Unlimited” tab and then the correct paperback price should appear. Then click on the “Paperback” tab to purchase the book at the right price. To all authors and self publishers check your prices, star ratings and comments. In a previous post over a year ago I mentioned that I had a number of 5 star ratings wiped from Amazon and people who purchased my books sent me emails telling me that they left comments on Amazon but Amazon did not publish them. Who knows how much Amazon will charge next. My book Revealed At Last may help you out in these times now that the world is going through changes politically, with natural disasters and spiritual awakenings.